It has been said that when it comes to success, it isn't what you know, but who you know. 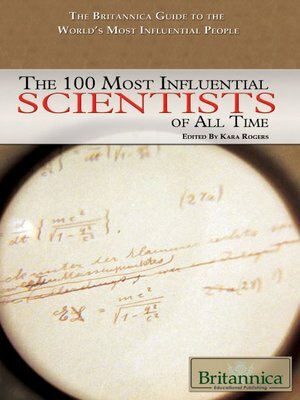 The 100 Most Influential Scientists of All Time is one title in this 8 book series, in which readers get the best of both worlds. Concise but information-packed biographies detail the lives and life's work of hundreds of leading individuals from an assortment of disciplines. Readers will get to know the foremost minds within science, art, writing, music, invention, politics and philosophy. Each valuable compendium offers a comprehensive index, complementary visuals, and behind-the-scenes details that reveal the very human nature behind world-changing personalities. Published in 2010 by Britannica Educational Publishing (a trademark of Encyclopædia Britannica, Inc.